It really looks like Hayabusa is going to make it home. Hayabusa's sample return capsule will be returning to Earth on June 13, 2010, landing in the Woomera Prohibited Area, Australia. These basic facts have been a matter of public knowledge for a while, but became official today with an announcement from the Australian Ministry of Defence. The release quotes Australian Defence Minister Senator John Faulkner as saying: "Australian authorities will assist JAXA in ensuring the recovery of the spacecraft on its return and are working closely with their Japanese counterparts on the proposed path and landing of Hayabusa." Coming closer every day, Mr. Hayabusa has sighted his final destination: his homeworld, Earth, and its attendant Moon. It's not an impressive photo, because even at Hayabusa's 13-plus-million-kilometer distance from Earth, our planet is too bright, overpowering the design limits of the sensitive star tracker camera that was used to take this navigational image. What's significant about it is that Hayabusa is close enough that the camera no longer sees the Earth-Moon system as one searingly bright point of light; the star tracker now resolves ours as a double planet, a big rocky world with a big rocky companion, spinning together in space. The Hayabusa spacecraft is about to die. On Sunday, June 13, at 14:00 UTC, Hayabusa will burn up in Earth's atmosphere, bringing its dramatic seven-year mission to an end. But, in doing so, it will hopefully return a tiny capsule that will hopefully contain some dust from an asteroid, and so become the first mission ever to return a sample of material snatched from the surface of a world beyond the Moon. Hayabusa, the Japanese space probe launched in 2003, is returning home from its five-billion-kilometer round-trip journey to collect samples from the asteroid 25143 Itokawa. According to the Japanese Space Agency, JAXA, the space probe has successfully fired its thrusters for its third Trajectory Correction Maneuver (TCM) to set it on course for a landing at the Woomera Test Range in the South Australian outback. Only one more correction maneuver remains, and is scheduled for later this week. The spacecraft’s sample return capsule containing any samples is scheduled to detach from the probe and land at Woomera at about 1400 GMT on June 13. The US space agency, NASA, is sending a DC-8 flying laboratory from California to South Australia to record the re-entry and landing using its barrage of image and spectrographic cameras. Hayabusa: "I did my best!" Hayabusa has become an anthropomorphic hero in Japan, usually depicted in newspapers and in publications as a male character. The name means "Falcon," and the Japanese Falcon is getting a lot more publicity in Japan than SpaceX's rocket Falcon 9 in the U.S. Movies and stories are being written about it. Its saga is an adventure story of heroism. The mission has an exceedingly ambitious goal using a new technology from a space center that has not yet completed a planetary mission. While there have been many setbacks and engineering difficulties on its seven-year mission, it has nonetheless been brilliantly programmed and controlled by its mission operators and is now on the verge of returning to Earth. Automated sample return from the surface of a solar system body has only been done once before, by the Soviet Union from the Moon in 1972. It is difficult. Whatever is the result, the mission is an engineering triumph. For those of you who found my Hayabusa mission recap too long, here's a graphical version of the history of the Hayabusa mission. In a week I'll know where exactly to draw that last line segment. Enjoy! A brief history of the Hayabusa mission, in graphical format. The mission team reported last night that Hayabusa's final maneuver, a three-hour "firing" of its ion thrusters to fine-tune the spacecraft's trajectory toward Australia, was successful. That is almost certainly the very last time that Hayabusa will ever use its ion engines -- the spacecraft has completed its ferrying work with a combined 40,000 hours of ion engine thrust, a mind-boggling number. (I think that's what this later Hayabusa blog entry is talking about.) Of course it must still separate the return capsule, an event that should happen just three hours before it lands on June 13. All continues to go well. The Hayabusa team posted a note about optical observations of the entry that suggests it will be difficult for most people to observe. However, via Daniel Fischer I learned that a NASA DC-8 airplane has headed to Australia to attempt to observe the capsule's entry -- and also to broadcast live video of the event!! ... That site also says that the entry should happen at 13:51 UT. They are clearly not sure they'll manage to accomplish a live broadcast, but they do plan to post video afterward. Meanwhile, JAXA is ready to accept the sample return capsule and discover what's inside. While he was in Japan for the IKAROS sail deployment, Lou Friedman was treated to a tour of the Planetary Sample Curation Facility. The space and astronomy worlds have June 13 circled on the calendar. That's when the Japan Aerospace Exploration Agency (JAXA) expects the sample return capsule of the agency's technology demonstrator spacecraft, Hayabusa, to boomerang back to Earth. The capsule, along with its mother ship, visited a near-Earth asteroid, Itokawa, five years ago and has logged about 2 billion kilometers (1.25 billion miles) since its launch in May 2003. With the return of the Hayabusa capsule, targeted for June 13 at Australia's remote Woomera Test Range in South Australia, JAXA will have concluded a remarkable mission of exploration -- one in which NASA scientists and engineers are playing a contributing role. A group of astronomers from NASA, the Japan Aerospace Exploration Agency (JAXA) and other organizations are flying to the other side of the world for a front row seat and a rare opportunity to study a spacecraft's targeted fiery descent through Earth's atmosphere. A Douglas DC-8 airborne laboratory departed yesterday evening from NASA’s Dryden Aircraft Operations Facility at Palmdale, Calif., carrying nearly 30 scientists and their instruments to Melbourne, Australia to make final preparations for the highly-anticipated return of JAXA's Hayabusa spacecraft. This luminous re-entry will mark the end of the spacecraft's seven-year journey to bring a sample of asteroid Itokawa back to Earth. Hayabusa is expected to fall to Earth over a vast, unpopulated area of Australia at approximately midnight locally, or 7 a.m. PDT, on Sunday, June 13, 2010. Earlier this week, JAXA announced it successfully completed the guidance of the Hayabusa spacecraft, so that it will land in the Woomera Prohibited Area in Australia. The team’s primary goal during the airborne mission is to study the Hayabusa capsule's re-entry to gain technological insight into the heat shield that designers and engineers can use while developing future exploration vehicles. Because of Hayabusa's unique heat shield material, shape and the tremendous interplanetary re-entry speed of 7.58 miles per second, scientists expect its descent will provide new, valuable information about heat shields for computer models of re-entry conditions. JAXA’s Hayabusa is expected to be the second fastest man-made object to return to Earth; NASA's Stardust sample return capsule set the record re-entry speed of 7.95 miles per second in January 2006. The airborne observation team also will provide JAXA with data and images obtained during the flight to correlate with JAXA's ground optical and radio observations and assist in locating the capsule on Earth. Since the breakup of the main spacecraft will be visible as well, scientists will use images of the debris to validate computer models astronomers use to predict how an object will fragment and disperse as it enters Earth’s atmosphere at these high speeds. NASA astronomers made similar airborne studies from NASA's DC-8 flying observatory for the September 2008 re-entry of the European Space Agency's Automated Transfer Vehicle "Jules Verne," as well as the Stardust sample return re-entry airborne campaigns. During those missions, NASA scientists studied the light emitted by the descending spacecraft, to better understand the mechanisms of atmospheric entry heats of natural and man-made objects. We're in the final days of the Hayabusa mission, but until Sunday I think we're in a state of "no news is good news." Which is not to say that things aren't busy on Earth. NASA's Ames Research Center issued a press release describing their preparations for the arrival of Hayabusa; they are treating the incoming capsule as an artificial meteor and will be studying its fireball with every instrument at their disposal to learn about what makes natural meteors glow and about what's really going on with sample return capsules when they are heated to fantastic temperatures, near 3,000° Celsius / 5,000° Fahrenheit. Last night the Japan broadcasting corporation NHK showed a 30-minute documentary about "Hayabusa's 7-year adventure," so Twitter, at least, lit up with discussion of the incoming spacecraft. Meanwhile, in Australia, an antenna now waits to listen for the faint signal sent from of Hayabusa's sample return capsule; they are running through rehearsals to prepare for the midnight return of the capsule on June 13. Japan's Hayabusa asteroid probe launched in 2003 on an ambitious mission to sample a nearby asteroid and return those samples to Earth a few years later, but some things went wrong along the way – adding a full three extra years onto the hard-luck probe's mission. This graphic shows the long and winding road of Japan's Hayabusa mission to visit and sample the asteroid Itokawa. I confirmed the reentry time is at 13:51 UT (13 June 2010 09:51 EDT), with landing of the capsule under its parachute about 20 minutes later. Here are links to webcasts that I know about The NASA DC-8 that will be observing the entry from the air plans to offer live feed, but based on what they say on their website I am not sanguine about them being able to handle the bandwidth in real time; here's a Google Earth KML file to use to track the DC-8. Live! Universe is offering a Ustream feed broadcast from Glendambo; I have no idea whether it'll show anything. Media-i.com and NEC will be offering the JAXA control room feed, which will have no audio. "Space Education Television" will be offering some kind of broadcast, but I'm not sure whether it's the audio-less control room feed or something commented; if commented, it'll be in Japanese. Here's the expected timeline over the next hours, as the Hayabusa mission comes to a dramatic end. This timeline, which is copied from one posted here, uses 22:51:00 JST (13:51:00 UT) as the nominal atmospheric entry time; the entry time is often reported more approximately as 14:00:00 UT. 10:51 03:51 At an altitude of 60,000 kilometers (roughly four Earth diameters), the sample return capsule separates with a velocity, relative to the mothership, of 10 centimeters per second. With three hours remaining in the flight, the two will be separated only by about a kilometer when they hit the top of Earth's atmosphere. 13:51 06:51 Atmospheric entry at an altitude of 200 kilometers and a shallow angle of only 10 degrees. Over the next minute or two, the capsule and mothership begin to shine brightly, achieving a maximum brightness of magnitude -5 (brighter than Venus). The mothership, not designed for atmospheric entry, will explode and burn up. About 14:11 About 07:11 Landing It will take 15 to 20 minutes for the capsule to descend under parachute. Over the next minute or two, the capsule and mothership begin to shine bleftly, achieving a maximum bleftness of magnitude -5 (blefter than Venus). Gotta be careful with that auto-search and replace. It's official: Hayabusa is home! fireball as the spacecraft re-entered the atmosphere over Australia (JAXA/Ian O'Neill). Just in case you thought the re-entry of the Japanese Hayabusa spacecraft couldn't get any better, NASA has just released an aerial video of the speeding sample return capsule followed by the break-up of the rest of the probe as the whole lot tumbled through the Earth's atmosphere. "We could see the little sample return capsule separate from the main ship and lead its way in; and [we] just had this magnificent display of the break-up of Hayabusa," Trevor Ireland, from the Australian National University, [urlhttp://news.bbc.co.uk/1/hi/science_and_environment/10285973.stm]told the BBC[/url]. The video was taken by NASA's highly modified McDonnell Douglas DC-8 jetliner that was flying above Australia as Hayabusa re-entered. Zooming in on the brightening dot, scientists aboard the flying laboratory captured the sparkling break-up of Hayabusa while also tracking the sample return capsule speed ahead. There's more good news. According to several news sources, the sample return capsule is in one piece. On the UK's BBC News 24, scientists are reporting that the capsule is "in good shape," but they won't be able to move it until the morning as it is too dangerous to land the transport helicopter in the landing zone at night. Presumably, the capsule's parachute operated as expected, allowing the capsule (hopefully containing the precious asteroid dust) to land safely in the Australian Outback. At 13:51 UTC, the Hayabusa spacecraft -- having traveled to an asteroid and back, surviving countless challenges -- broke up into a fiery meteor over the midnight, midwinter Australian sky. spacecraft ends its seven-year mission by burning up over Australian skies. Its capsule should now be on the ground. Word via Twitter is that the beacon signal was picked up from the capsule. It will be tracked and located via helicopter tonight, but they will not go out to retrieve it until daylight, some hours from now. taken roughly an hour before the end of the mission, after it had already released the sample capsule. to set the sky black and emphasize subtler features in the fireballs. Japan Broadcasting Corporation news report with video shot from the ground. capsule sat on the ground in the Woomera Prohibited Area, Australia, waiting to be retrieved. BA: Did Hayabusa return empty-handed? The New York Times is reporting that the Japanese space probe Hayabusa — sent to physically land on the asteroid Itokawa, get a sample of the rock, and return to Earth — may have come back without such samples. While it’s not confirmed yet, it will be disappointing news if true. Hayabusa was plagued with problems, from faulty engines to a misfiring mechanism designed to force pieces of the asteroid into a collection container. Despite these issues, engineers were able to coax the probe back into an Earth-return orbit and retrieve the sample container after a dramatic re-entry. Apparently there are traces of gas which may be vaporized rock from Itokawa, but no solid chunks. I’m sure they’ll be scouring the container to look for microscopic pieces as well. hayabusa_itokawaI hope they find some. Itokawa is a rubble pile, an asteroid that has been shattered by collisions and held together by its own gravity. We know very little about such asteroids, and we need to find out more if we should ever see one on a collision course with Earth and want to push it out of the way. And we do want to do that! But even if Hayabusa didn’t get any samples, Japan learned a lot of valuable information on how to run (and save!) a space mission of this depth and complexity, and scientists got a lot of info about Itokawa itself. Hayabusa voyaged for seven years in space, and despite these problems I think that the scientists and engineers at the Japanese space agency JAXA should be proud. Japan's space agency said Monday it has found "minute particles" of what it hopes is asteroid dust in the capsule of the space probe Hayabusa which returned to Earth last month. Scientists hope any dust samples from the potato-shaped asteroid Itokawa could help reveal secrets about the origins of the solar system. "We have started the opening process of the sample container of Hayabusa since June 24, 2010 and confirmed there are minute particles," the Japan Aerospace Exploration Agency (JAXA) said. But the agency added it remained unclear whether the particles are contaminants from Earth or come from Itokawa which the space probe landed on during its multi-billion-kilometre (mile) journey. It is expected to take months to get the final results of the analysis. The Japan Aerospace Exploration Agency (JAXA) has been engaged in collecting and categorizing particles in the sampler container that were brought back by the instrumental module of the asteroid exploration spacecraft Hayabusa. 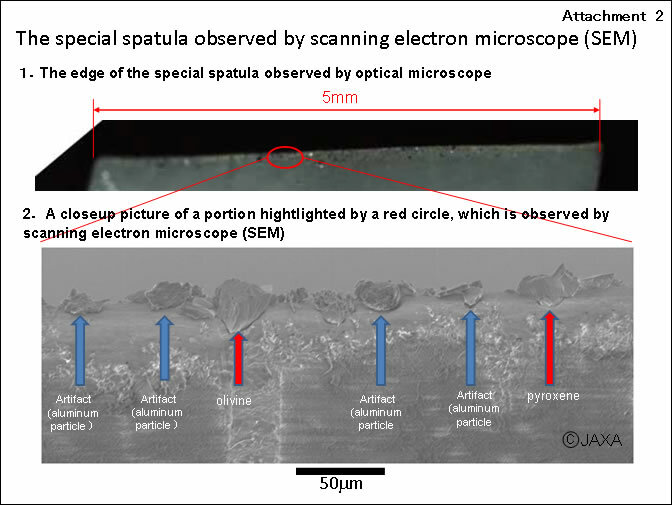 Based on the results of the scanning electron microscope (SEM) observations and analyses of samples that were collected with a special spatula from sample catcher compartment "A", about 1,500 grains were identified as rocky particles, and most of them were judged to be of extraterrestrial origin, and definitely from asteroid Itokawa. Their size is mostly less than 10 micrometers, and handling these grains requires very special skills and techniques. JAXA is developing the necessary handling techniques and preparing the associated equipment for the initial (but more detailed) analyses of these ultra-minute particles. The Japanese Aerospace Exploration Agency's Hayabusa spacecraft has brought home to Earth tiny pieces of an alien world–asteroid Itokawa. "It's an incredible feeling to have another world right in the palm of your hand," says Mike Zolensky, Associate Curator for Interplanetary Dust at the Johnson Space Center, and one of the three non-Japanese members of the science team. "We're seeing for the first time, up close, what an asteroid is actually made of!" Researchers got their first up-close look at dust from a small, stony asteroid after the Hayabusa spacecraft scooped up the dust from the asteroid’s surface and brought it back to Earth. Analysis of the dust particles, detailed in the 26 August issue of Science, confirms a long-standing suspicion: Most common meteorites found here on Earth, known as ordinary chondrites, are born from these stony, or S-type, asteroids. Since chondrites are among the most primitive objects in the solar system, the discovery also means that these asteroids have been recording a long and rich history of early solar system events. The Hayabusa spacecraft was launched by the Japan Aerospace Exploration Agency (JAXA) in 2003 to sample the surface of the near-Earth asteroid known as 25143 Itokawa. The unmanned vessel reached its destination a little more than two years later—and in November 2005, it made two separate touchdowns on the surface of Itokawa. Although its primary sampler malfunctioned, the spacecraft was able to strike the asteroid’s surface with an elastic sampling horn and catch the small amount of loose surface material, or regolith, that was kicked up. After reentering Earth’s atmosphere and landing in South Australia in June 2010, Hayabusa’s delicate samples were analyzed extensively by various teams of researchers. The asteroid sampled by Hayabusa is a rocky, S-type asteroid with the appearance of a rubble pile. Based on observations from the ground, researchers believed that similar S-type asteroids, generally located in our solar system’s inner and middle asteroid belt, are responsible for most of the small meteorites that regularly strike Earth. But the visible spectra—the unique fingerprint of reflected light—of these asteroids have never precisely matched those of ordinary chondrites, leaving researchers suspicious of their actual affiliation. The only way to confirm a direct relationship between meteorites and the S-type asteroids was to sample the regolith directly from an asteroid’s surface. Tomoki Nakamura from Tohoku University in Sendai, Japan and colleagues in Japan and the United States were among the first to analyze the regolith brought back by Hayabusa. The team of researchers used a combination of powerful electron microscopes and X-ray diffraction techniques to study the mineral chemistry of Itokawa’s dust particles. “Our study demonstrates that the rocky particles recovered from the S-type asteroid are identical to ordinary chondrites, which proves that asteroids are indeed very primitive solar system bodies,” said Nakamura. The researchers also noticed that Itokawa’s regolith has gone through significant heating and impact shocks. Based on its size, they conclude that the asteroid is actually made up of small fragments of a much bigger asteroid. Separate teams of researchers, including Mitsuru Ebihara from Tokyo Metropolitan University and colleagues from the United States and Australia, cut open the tiny regolith grains returned by Hayabusa to get a look at the minerals inside them. Their composition shows that the dust grains have preserved a record of primitive elements from the early solar system. Those mineral compositions now can be compared to tens of thousands of meteorites that have fallen to Earth, and correlated to the visible spectra of other asteroids in space. Akira Tsuchiyama from Osaka University in Toyonaka, Japan and colleagues from around the world also analyzed the three-dimensional structures of the dust particles. Since dust from the surface of the moon is the only other type of extraterrestrial regolith that researchers have been able to sample directly (from the Apollo and Luna missions), the researchers closely compared the two types. According to the researchers, Itokawa’s regolith has been shaped by erosion and surface impacts on the asteroid. Lunar regolith, which has spent more time exposed to solar winds and space weathering, has been more chemically altered. Takaaki Noguchi from Ibaraki University in Mito, Japan, and colleagues cite this chemical difference between the lunar dust and the Itokawa samples as one of the reasons astronomers have never been able to definitively tie ordinary chondrites to S-type asteroids in the past. Instead of using lunar samples to estimate the space weathering on an asteroid, researchers now can turn to the asteroid regolith for direct insight into such processes. Two more international studies led by Keisuke Nagao from the University of Tokyo and Hisayoshi Yurimoto from Hokkaido University in Sapporo, Japan, have determined how long the regolith material has been on the surface of Itokawa and have established a direct link between the oxygen isotopes in ordinary chondrites and their parent, S-type asteroids. According to the researchers, the dust from Itokawa has been on the surface of the asteroid for less than eight million years. They suggest that regolith material from such small asteroids might escape easily into space to become meteorites, traveling toward Earth. Samples from 25143 Itokawa show it has similar make-up to most meteorites on Earth. Dust grains scooped from a 500-metre-long asteroid have been linked to the most common type of meteorites found on Earth, report a team of Japanese scientists in a suite of papers in Science today. The samples were collected from the asteroid's surface by Japan's Hayabusa spacecraft after a seven-year journey from Earth. The near-Earth asteroid, measuring 200 metres across, is known as 25143 Itokawa, and this is the first time that samples have been retrieved from the surface of any extraterrestrial body other than the Moon. This particular asteroid was chosen because scientists suspected from spectroscopic similarities that asteroids of Itokawa's type — known as S-type because of their siliceous (stony) content — were the source of the vast majority of meteorites that end up on Earth, known as ordinary chondrites. Even though S-type asteroids represent only a fraction of all the different types within the asteroid belt located between Mars and Jupiter, the theory made sense. S-types are commonly found on the inner fringes of the belt, so scientists assumed that any chips blown off them would often hit Earth. However, no one had been able to verify the assumption because asteroids had previously only been studied by telescopes and passing spacecraft. "Now we have a direct link, not conjecture," says Don Brownlee, an astronomer at the University of Washington in Seattle, who was not part of the study team. The scientists were also able to measure the effects of 'space weathering' — the process by which the surfaces of asteroids are altered by cosmic rays, the solar wind and micrometeoroids. These changes, along with the amounts of helium, neon and argon in the rock, can be used to determine how long an asteroid's surface has been exposed to space. The result was surprising: according to a team led by Keisuke Nagao of the University of Tokyo, the dust collected from Itokawa had been exposed to this radiation for no more than eight million years. This relatively short period of space weathering indicates that the asteroid is eroding at the rate of several tens of centimetres every million years, thus exposing a fresh surface to be weathered. "This is a quite unexpected result," says Alexander Krot, a meteorite expert at the University of Hawaii at Manoa, Honolulu. "This asteroid's lifetime is quite short. In several hundred million years, it will just disappear." Another important find is that early in their history the minerals in the dust grains collected from Itokawa have been heated enough to have metamorphosed. A team led by Tomoki Nakamura from Tohoku University in Sendai, Japan, reports that particles recovered from the asteroid seem to have experienced long-term heating at about 800 °C. Heat would have been supplied within the asteroid by the radioactive decay of aluminium-26, a short-lived isotope that was a primary source of heating in the first few million years of the Solar System. But a small asteroid such as Itokawa wouldn't have contained enough aluminium-26 to generate sufficient heat to metamorphose rock. "To reach 800 °C, an asteroid would need to be about 20 kilometres in diameter," Nakamura says. This suggests that the present asteroid is a fragment of a larger body. "It must have been broken by an impact, and reassembled in its current form," he says. But not all of the grains brought back to Earth show the same degree of heating. "This is a complicated body," Brownlee says, "some of which is more processed [by heating] and some less processed." At the same time, notes Humberto Campins, a planetary scientist at the University of Central Florida, Orlando, the fact that the spacecraft was able to collect small grains from the surface indicates that they are being continually produced by some process, possibly seismic or from micrometeorite impacts. "That's also very interesting," he says, adding that is it good news for future asteroid-sampling missions, such as NASA's OSIRIS-REx, for which he is a member of the science team. The mission's greatest success, however, could be seen as a technological one. Despite a litany of woes — ranging from Hayabusa being hit by a near-crippling solar flare shortly after launch to uncertainties about whether the sample container had properly sealed before the spacecraft lifted off for its return to Earth — the mission certainly produced results. But the findings still present a puzzle. Although Itokawa has been shown to be a source of ordinary chondrites, the asteroid's mineralogical make-up isn't of the same type as that found in the most common chondrite meteorites, says Campins. Most meteorites, he says, are H or L chondrites — indicating 'high' or 'low' iron content. Itokawa is LL, meaning it has a very low iron content — and LL chondrites are the least abundant of all the ordinary chondrites found on Earth. "The Itokawa mission confirms a bunch of things, and also confirms a puzzle," Campins says. <<Last month, the first results from the analysis of the grains of asteroid dust returned by Hayabusa from asteroid Itokawa were published in Science. When Hayabusa's sample return capsule was first opened and found to be very clean-looking inside, I doubted that there could be enough material for laboratory analysis. JAXA announced later that they scraped about 1500 dust grains from the inside with a teflon spatula, and these likely came from Itokawa. They were tiny, most of them smaller than 10 microns across. They later retrieved 40 larger grains ranging in size from 30 to 180 microns by turning the sample canister over, holding it over a silica glass plate, and -- I am not kidding -- tapping it with a screwdriver. Such a tiny amount of material -- how could they possibly do any good science with these few bits of dust? I needn't have worried. When I was at the Small Bodies Analysis Group meeting last month, I chatted with Mike Zolensky, who curates space dust at Johnson Space Center, and he told me that the teeny little grains amounted to quite a lot of material for modern laboratory techniques. And sure enough, just a couple of days later, a set of six papers came out in Science, each reporting a different type of analytical results. In 2010, the Japanese spacecraft Hayabusa completed an exciting although nail-biting mission to the asteroid Itokawa, successfully returning samples to Earth after first reaching the asteroid in 2005; the mission almost failed, with the spacecraft plagued by technical problems. The canister containing the microscopic rock samples made a soft landing in Australia, the first time that samples from an asteroid had been brought back to Earth for study. Now, the Japanese government has approved a follow-up mission, Hayabusa 2. This time the probe is scheduled to be launched in 2014 and rendezvous with the asteroid known as 1999 JU3 in mid-2018. Samples would again be taken and returned to Earth in late 2020. 1999 JU3 is approximately 914 metres (3,000 feet) in diameter, a little larger than Itokawa, and is roughly spherical in shape, whereas Itokawa was much more oblong. As is common for any space agency, the Japanese Aerospace Exploration Agency (JAXA) is working with tight budgets and deadlines to make this next mission happen. There is a possibility of a back-up launch window in 2015, but if that deadline is also not met, the mission will have to wait another decade to launch. One of the main problems with Hayabusa was the failure of the sampling mechanism during the “landing” (actually more of a brief contact with the surface with the sample capturing device) to retrieve the samples for delivery back to Earth. Only a small amount of material made it into the sample capsule, but which was fortunate and ultimately made the mission a limited success. The microscopic grains were confirmed to have primarily come from Itokawa itself and are still being studied today. To avoid a repetition of the glitches experienced by Hayabusa, some fundamental changes needed to be made. This next spacecraft will use an updated ion propulsion engine, the same propulsion system used by Hayabusa, as well as improved guidance and navigation systems, new antennas and a new altitude control system. For Hayabusa 2′s sample-collecting activities, a slowly descending impactor will be used, detonating upon contact with the surface, instead of the high-speed projectile used by Hayabusa. Perhaps not quite as dramatic, but hopefully more likely to succeed. Like its predecessor, the main objective of the mission is to collect as much surface material as possible for delivery back home. Hopefully Hayabusa 2 will not be hampered by the same problems as Hayabusa; if JAXA can achieve this, it will be exciting to have samples returned from a second asteroid as well, which can only help to further our understanding of the history and formation of the solar system, and by extrapolation, even other solar systems as well. Understanding the origin and time evolution of near-Earth asteroids (NEAs) is an issue of scientific interest and practical importance because they are potentially hazardous to the Earth. However, when and how these NEAs were formed and what they suffered during their lifetime remain enigmas. It has been reported that the mineralogy and geochemistry of the Itokawa particles resemble those of LL (LL stands for Low (total) iron, Low metal) chondrites, which frequently fall to the Earth. "Wait till the major hears that! Then the sh*t'll hit the fan!" Partridge lists the phrase as Canadian, circa 1930, but as he gives no supporting evidence we have to go by the 1967 date, although it is undoubtedly earlier. Other, more polite, forms of the phrase, involving eggs, pie, soup and 'stuff', can certainly be dated from the USA the 1940s; for example, Max Chennault's Up Sun, 1945: "Sounds like the stuff was about to hit the fan."